With the end of summer being a bit colder than usual, leaves are already starting to turn. 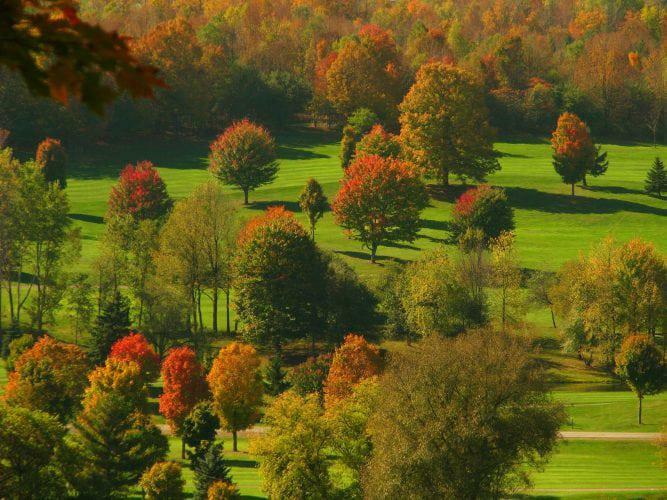 This may be a good reason not only to play golf but also to enjoy the beautiful fall foliage at Byrncliff Golf Resort & Banquets, a public golf course in Varysburg, NY nestled in the hills of Wyoming County in the Greater Niagara region, 35mn south of Buffalo and about one hour from Rochester. Byrncliff Golf Resort & Banquets is one of Western New York’s most popular resort destinations, widely known for its golf course, restaurant, banquet facility and conference center, but also for cross country skiing - off Route 20A. They offer stay and play packages ideal for group of golfers and couples who want privacy to enjoy the last few days of the season. This year, the resort celebrates its 50th anniversary. Byrncliff Golf was founded in 1967 in Varysburg, NY by Clifford Meidenbauer and a group of other investors from Lancaster NY. Their vision was to create a country club in the beautiful rolling hills of Varysburg, Wyoming County, just 35 minutes south of Buffalo. Together with the help of a golf architect in the Buffalo Hill Valley, they laid out this popular golf resort. Over time, Meidenbauer decided he wanted to open up the country club to a wider audience and he turned it a semi-private golf resort, adding a club house, lodging, hotel rooms, and banquets / conference centers. Today, Byrncliff features a picturesque 18-hole golf course par 72, recognized as the #8 best public golf course in Western New York in reviews by Buffalogolfer 2015 (#3 south of Buffalo), a full service restaurant and bar, overnight lodging, a driving range, mini-golf, and a heated pool. In the winter, Byrncliff is the closest place to Buffalo that offers cross country skiing with rentals and beautifully groomed tracks. Many snowmobile on the property and love it. The golf course is reputable for being beautiful, quiet but also challenging thanks to its rolling hills. It provides a great playground for golfers of all skill levels, groups, locals from the region and tourists from the Eastern US and Ontario, wanting to golf, dine, or gather for any social occasions and experience the warm hospitality. Speaking to this publication, Scott “Scotty” Meidenbauer, son of Clifford Meidenbauer said, “People that come here keep coming back saying it’s so beautiful down here.” He now runs Byrncliff together with his wife Patty, daughter Lindsay and son-in-law Brian. “We have a great team taking care of the golf course and the facility. Everyone’s really engaged in helping make Byrncliff a great place to stay and play” says Scott. Byrncliff Golf has additionally invested into state of the art irrigation systems and bunker enhancement to make it the great course it is today. Byrncliff Golf has a restaurant, famous for its steaks, fish frys, chicken wings (and we hear, “all you can eat” crab legs). The bar has wide windows to take in the view. The resort offers rooms for any social occasions, weddings, or business meetings. Byrncliff’s purpose and policy, Meidenbauer said, “is to build upon what my dad always wanted to do, that is to entertain via celebrating nature, create a memorable experience for our guests to enjoy Byrncliff with friends and family”. We gather this means a philosophy of hard work, well maintained greens and fairways and a smile. A look at their rates will probably reveal that the resort is competitively priced and already famous for its price packages. A golf resort with a 18 hole, par 72 golf course, hotel, bar & restaurant, heated pool and winter activities nestled in the rolling hills of Wyoming county, Varysburg, NY 35 minutes south of buffalo. For daily and/or overnight stay, golf outings, banquets and weddings. For bookings, you can visit byrncliff.com or contact Lindsay Eddy on +1 (585) 535 7300 or [email protected]. This video will give you a glimpse of the facilities and what you can expect.